“Revolution is very creative with their flavors. It is definitely worth stopping by for a vanilla bean and the current flavor of the week!” - Liz G.
“The raspberry donut. Pick it. You're welcome.” - Alicia W.
“The toasted almond cake donut was on another planet of flavor. 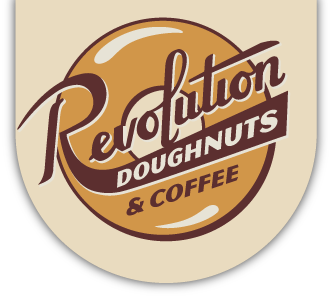 This local Decatur spot is a Do-nut miss!” - Dave P.
“These donuts were freaking outstanding! I cannot love these fluffy pieces of deliciousness enough!” - Hannah C.
"Revolution always has great customer service - they are always very kind, quick, and, of course, the doughnuts are amazing." - Cathryn M.
"Like the last time...Above and beyond. This is still the only donut this non-donut person will eat!" - Alecia C.
"Always a pleasure - don't change." - Jamila C.
"The donuts are awesome and so are the people who work there! Thank you!" - Christopher A. "Nice to do business where people recognize you and their APPLE FRITTERS are wonderful." - Thomas B. "Miranda was so super wonderful and kind and attentive. I love her. My coffee was superior. Malik was the best barista ever!" - Deborah M.
"As usual we got exemplary service and excellent doughnuts. Even on a holiday rush everything was fantastic." - Claude T.
"It's always a great experience at Revolution...one of our favorite spots in the neighborhood." - Carla C.
"Rainy morning and I just got greeted with the warmest smile and amazing Doughnuts. What is there not to love?" - Maria B. "Delicious food and accommodating staff!!" - Samir W.
"Amazing service!" - Elizabeth S.
"Our first visit today. The donuts were wonderful and the staff professional and helpful." - Becky M.
"The staff working is so incredibly nice! They give really great service and put a smile on my face." - Nadia B. "Love coming here as the experience is always great and the donuts are the best." - Brittany B. "The customer service is always a reason I keep coming back." - Stephanie G.
"Staff so friendly and donuts sooooo good!" - Wendy D.